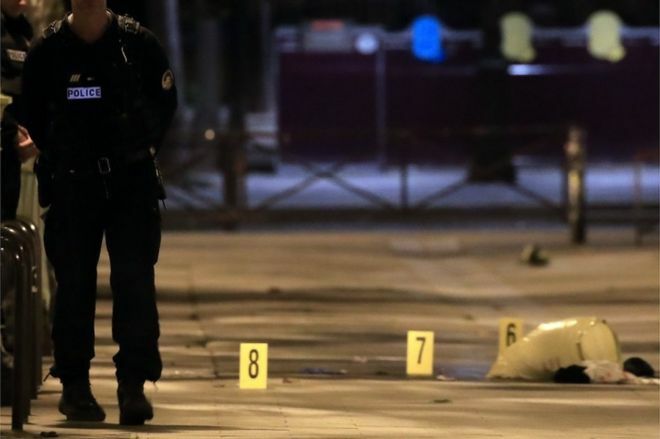 French police have detained a man who stabbed seven people, injuring four seriously, in an attack on tourists and passers-by in Paris. 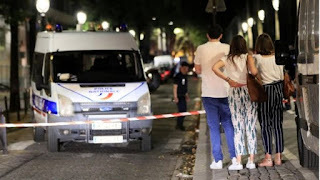 The man, wielding a knife and iron bar, struck just before 23:00 (21:00 GMT) by a canal in Paris's 19th district. People playing pétanque - a French bowling game - threw metal balls at the attacker, and he was overpowered. The man, said to be Afghan, was soon arrested. The incident is currently not being treated as a terrorist attack. Among the victims were two British tourists - police say the two men, in their fifties, suffered serious stab wounds to the chest and stomach. The knifeman initially stabbed two men and a woman near the MK2 cinema on the Quai de Loire, along the Ourcq canal on Sunday, reports say. The British embassy in Paris told the BBC: "Our consular staff are assisting two British people who have been hospitalised in Paris, and are in contact with French medical staff who are treating them."